About a year ago, in late 2017, we were going through a move and packing things up. I left the door to the closet open and my son saw the safe. I usually tried to keep the closet closed to hide the safe because he’d developed an odd fascination with it and pressing the buttons to make it beep. He also liked having us open and close it a lot – it’s all great fun apparently. Once he saw it, and remembered that it was there, he wanted to play with it and it’s often not very fun to argue with a toddler. This time, I think for the first time, when we opened the safe, he went after something inside it: a tube of 2010 American Eagles and some smaller tubes of Sunshine mint ½ ounce rounds that I had in there on top of all the NGC display boxes. Initially I really didn’t want him messing with it but he was insistent and cute and so he ended up getting to dump them out and play with them. I guess I decided around that point that they’re just bullion rounds that I was keeping mostly as silver. It doesn’t really matter if they stay pretty. They’re still worth melt, and he was being cute – also, I’m a sucker and he gets what he wants, probably way too often. One of the pictures I’ll post at the end of this entry is from this time. I think it’s the first time he’s really showed interest in these shiny little disks of metal that we call coins / rounds / tokens. We didn’t really repeat this experience for a while. In Sep 2018 I decided to give him some rounds to play with. I’d recently gotten a small 10 round tube of 1 oz buffalo bullion rounds (since there was room in the tube for one more round, I bought an 11th round and added that to the tube). I gave him that to play with one day – he was sick and I was hoping it would cheer him up. It did the trick. He enjoyed them so much that I started leaving this small tube out, often in the living room or our bedroom. Sometimes he’d see it and ask to have it to play with. Sometimes he would just think of them and ask for them, saying, “I want my monies, Daddy.” I don’t know where he got the idea that they were “monies.” I guess it was because we’d counted and rolled up coins from a piggy bank that had gotten full and he heard us call the coins “money.” That’s about all I can figure. I didn't mention this in the prior entry about it, because it might not have made sense without this context, but he also called the elongated cent from the zoo a "money" / "my money." They are sometimes called “daddy’s monies,” but only when he isn’t feeling possessive – if you ask him what they are I’d say it’s about 50/50 whether he responds with “it’s my monies” or “it’s daddy’s monies.” It’s the same tube of rounds. I’m pretty sure he knows this, but the ownership of them is clearly a bit fuzzy and poorly defined. By this point he’d learned to count to about 15 so we had a lot of fun at various times sitting down and counting the rounds. He’d dump them, we’d count the rounds as he put them back in the tube one at a time, and he’d dump them again when we finished. Over and over – and over. Those buffalo rounds have been smacked and banged together a lot in a way that only a toddler can manage and they’re quite scratched and abused-looking at this point – but that doesn’t bother him at all so far as I can tell. 99% Silver does not support bacterial growth and biofilms in the same way that some things like copper can. Generic silver rounds don’t have any historical value so I don’t feel guilty watching him trash them in the same way that I would, say, old Morgan dollars. Even if they’re circulated common dates, I’d just hate to see nearly 100-year-old coins abused by a toddler. I’ve tried showing him some of my Chinese pandas recently (he likes bears, I think). When I ask him what it is, instead of focusing on the fact that it’s a picture of a bear he sees the fact that it’s a large silver coin and says, “it’s a money.” He’s not wrong. It’s a nice place to start a love-affair with coins. I think one of the funnier moments to come out of these introductions to coins was showing him a graded coin for the first time. He looked at it for a second, flipped it around a bit, then started trying to find a way to open the slab and said, “We need open it.” “Uhh… No. Let’s not.” I’m sure that will make him popular with those that think coins in general and modern bullion products especially should be raw, but not happening. Not in this house while I’m around. Previous entry So… Why the Rooster? That sounds and looks like fun. I started collecting when my kids were no longer toddlers with that curiosity. If I had started earlier, no doubt I would be doing the same. How old are yours now then? Have they hit the teenage years where-in you're no longer interesting or cool? "You let that young'un bang them bullion coins around all he wants to." Seriously, there will be plenty of time later on to teach him proper care and handling. 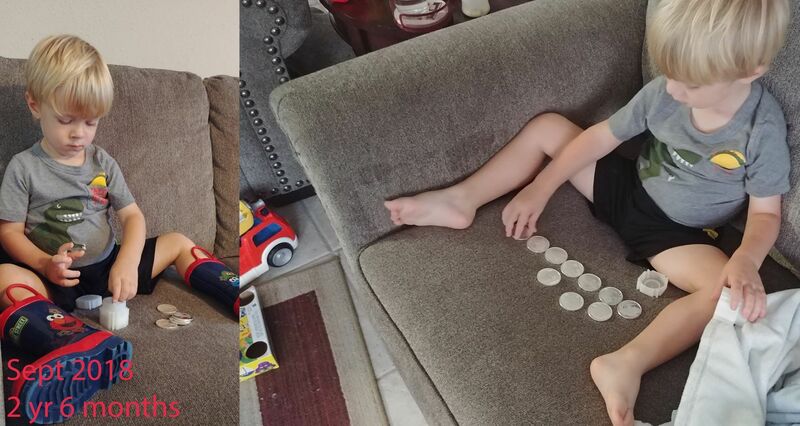 For now, he is having fun with his "monies," and this is a great time not only for bonding with Dad, but also for teaching a multitude of subjects: addition, subtraction, geometry, balance/center of gravity, and many others. You can teach him how to spin them, stack them, and flip them.You can let him pretend to buy something from your "store,"and teach him to make change. The possibilities are limitless. Have fun while he is still young. 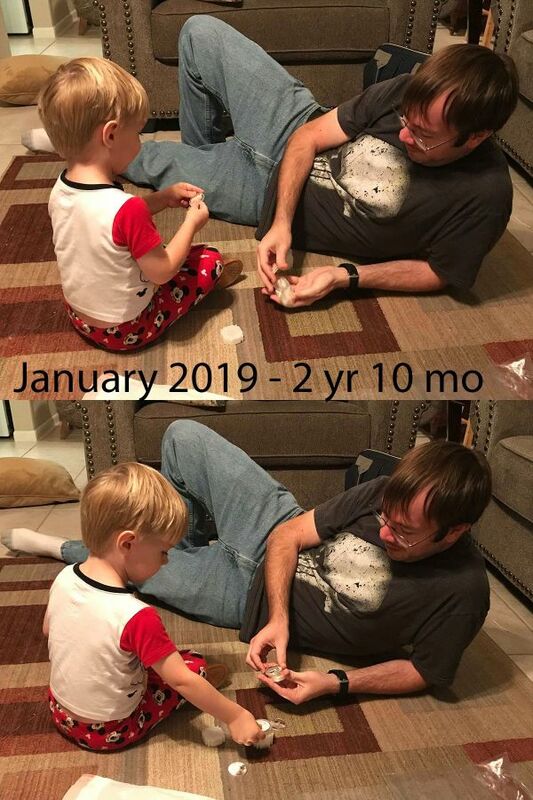 They grow up WAY to quickly. Great idea! He will remember that forever. I bought my kids some kilo bulk lots of world coins at auction and a world map to go on the wall. They spent many many hours trying to match coins to the countries, and sticking them on the map, it was a great way for them to learn where each country was although places like 'Sarawak' caused some confusion as they no longer exist . Unlike your son it was the ones with animals on or funny shapes that they were most interested in and it also meant that they got some funny looks on holidays when they wanted to know why it wasn't Pesetas in Spain, Lira in Italy and Marks in Germany - however this did then prompt them to start looking for the different countries on the euros. They still go through their change trying to put date sets together and looking for the special 50 pence pieces we have here in the UK so I guess something sank in over the years! Yup. Hard to believe some days that he's almost three and about 3.5 feet tall. And, yeah, those buffalo rounds were the sacrificial lambs. They're scratched and beat quite well at this point. When he's not around sometimes I just sit at my desk and mess with them too, let myself feel them and hear them chink together. Yeah, most of that and some of the things that Bob was talking about are still a bit beyond him but he'll work up to it. I actually ended up bringing home some of those circulating commemorative 50 pence coins with me when I visited Scotland in late 2017 with my wife. I have a bunch of coins from various countries as I've noted in journals before, but some of those come down to me from my grandfather and, valuable or not, he won't be getting those to play with for quite a while. Nice to see other young people passing this on to the toddlers of today. it is surprising how similar my experience is, with the same color carpet, and similar safes in a closet, and a kid who is about 3 months younger than yours, and who loves to press the buttons until it locks up and just flashes for a while. I let him hold a plastic tube of peace dollars that he dropped on his toe and it cut it a little with some bleeding, my wife got pissed. He's careful enough since about 2 yrs. 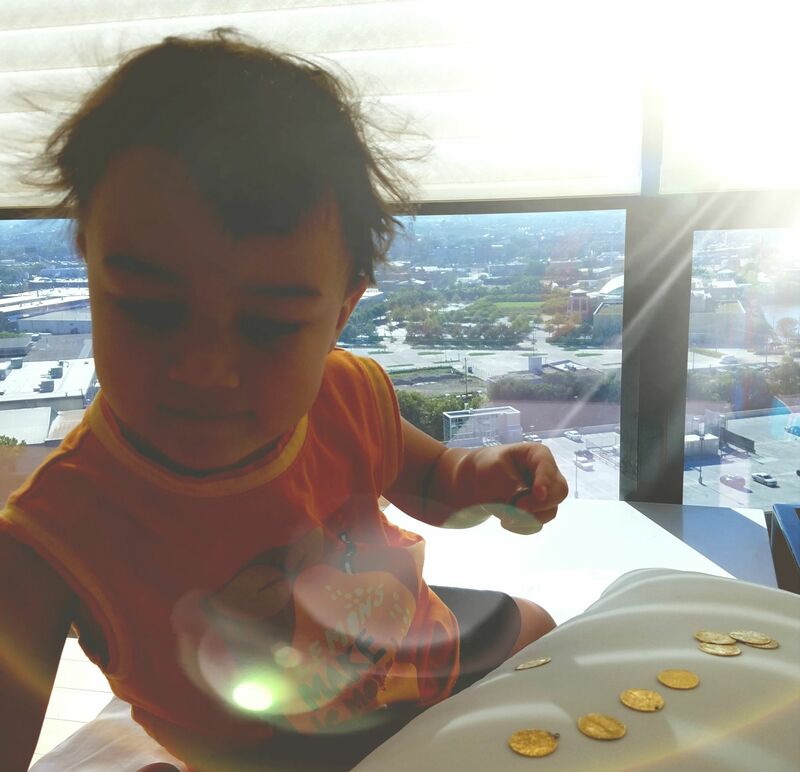 that I let him look at beat up old gold coins. 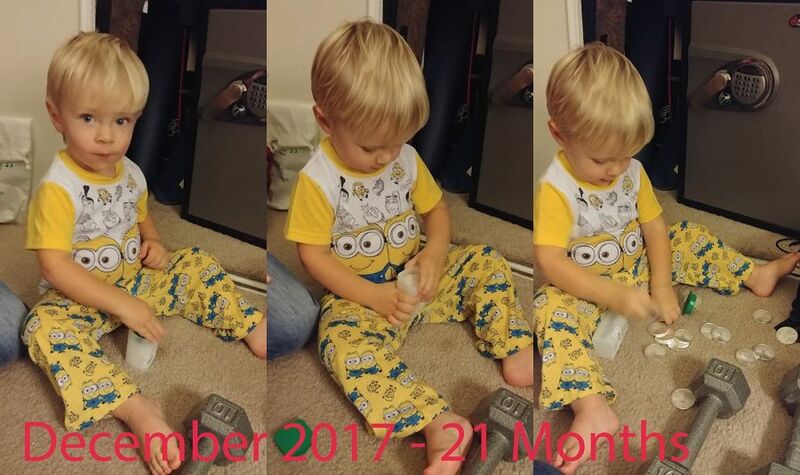 It looks like you may have a future collector on your hands!!! It's great that you're introducing Ben to aspects of the hobby so young, and those buffalo rounds were a good sacrifice toward a great cause! As someone who is in the field of education (though I teach adults and not children), I also love seeing parents who are willing to give their children a solid, hands on learning experience. It's always better when someone can actually touch something and experience it that way when you're exposing them to something like coins. I also love seeing the future of our great hobby, and you gave us all a great glimpse of that as did you deposito. When people talk about the hobby being in decline, being an older person's game or something like that, I'd love to show them posts like these. Our hobby definitely has a future. When people talk about the hobby being in decline, being an older person's game or something like that, I'd love to show them posts like these. Our hobby definitely has a future. Personally, I think the bigger threat to our hobby / community is the decline of cash, the rise of digital transactions and the specter of a cashless society in the future. People (and kids) these days are increasingly not using cash on a daily basis - I usually go weeks without using cash, months without using coins. I think if we have a generation that doesn't have that visceral connection to coinage you might see the hobby take a huge hit at that point. The other part of this is that most people just don't understand silver and gold as a valuable thing anymore. There are videos on YouTube of a guy offering people a 100 oz silver bar (when silver was at $16/oz), for $100 and he was in front of a coin shop, offering to let them test it to verify that it was real, and no one was willing to buy it from him for 7-8 cents on the dollar because they just didn't know. I'm surprised even a dude close to my own age, late 30's, is collecting coins, let alone 2 year olds. I asked my 73 year old dad if he knew anyone else who collected coins the whole time since he started as a kid. Nope. Maybe one kid he knew when he was in junior high, but not since then. I have never met anyone who collected coins, except online. The guy who sold the 1804 silver dollar for 3.25 million in 2008 said he started collecting dollars because he used to get paid a dollar a week on his paper route. Never gonna happen again. 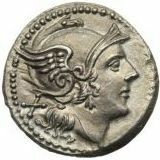 Curiosity about history, which has mostly evaporated in the US, is the only thing that is going to get any Americans interested in exploring coins. That curiosity exists in Asia and the Middle East, coincidentally the same places that have more widespread familiarity with precious metal ownership. I don't worry about it. If all goes as planned, my collection never gets sold anyways. I'm surprised even a dude close to my own age, late 30's, is collecting coins, let alone 2 year olds. Well, I'm actually only 32, but I agree on the general decline in the study of History in the US, and the decline of the love of knowledge in general. I was introduced to the idea of collecting coins from my grandfather's coins and by my family emphasizing that coins from 1964 and before should be saved because they were special. I myself still use mostly cash, but I realize how rare that truly is and I wonder if it would be the case if I didn't collect coins and currency. I use a credit card that gives cashback for everything and pay it off at the end of the month - I even put my kid's daycare on the card and pay it off. I get a decent amount of cashback this way and I never pay interest, so it works for me. At your son's age I think that the chances he will continue with collecting are much better than it was with my kids. My daughter had no interest in coins and collecting whatsoever and my son only had a passing interest. When my son was in his pre-teen years I got him a state quarter board that he enthusiastically started but quickly lost interest. As he grew older he worked at a Wendys restaurant and brought home $2 bills and Buffalo Nickels exchanged from the till. Seeing at least a little interest, I bought him a sheet of $2 bills and had them framed for Christmas. As a young adult he bought a set of colorized Star Wars coins from Niue housed in a Millennium Falcon model that when you opened the Falcon to view the coins it went into hyperspace with the hyperspace sound effect. However, when push came to shove and he needed money he wanted to sell them. Thinking that it would be a shame to sell them I told him I would buy them from him and hold them if he ever wanted to buy them back. Now that he is getting settled into a professional career he has not asked to buy them back yet. I also bought him a gold Mercury Dime one year for his birthday but I'm afraid to ask him if he sold that also. Still all those little sparks along the way failed to ignite any lasting interest. With limited or no interest in coins from my kids, I'll probably sell my collection at some point and make it a part of my estate for their inheritance. At your son's age I think that the chances he will continue with collecting are much better than it was with my kids. I certainly hope both Ben and Samuel will take an interest in this stuff, but, as I've said several times already in other posts I've made recently, I know going in that they might not. I think getting in early and capturing their imagination by sharing this stuff and talking about it will be important. That's part of why I do some of the research and learn the history the way I do and why I've cultivated in myself the ability to write and talk about this stuff with joy, curiosity, and passion in such a way that that comes across. But in the end it will be what it will be. Sorry to hear it didn't work out well with your son. It'll be a sad day if your sets go on the block but that's the way all of us and all of our collections have to go eventually (baring destruction by some disaster).